Being as fully equipped as your neighborhood bistro or café heralds the beginning of countless healthy and savory evening gatherings. Serve up to twelve hot, plated entrées from your vertical warming cupboard. For larger events, serve directly from your warming cupboard to table using standard chafing dishes, up to 9-quarts each. Your designer and architect will appreciate how brilliantly your range sets off their cabinet design and floor layout. Friends, family and associates may relax securely, knowing you are in full command of the event. The Sully 1800 at 71 1/16″ wide has it all: a stepped array of up to nine burners (or up to eight burners and a cast iron simmer plate) plus two ample ovens and a warming cupboard. 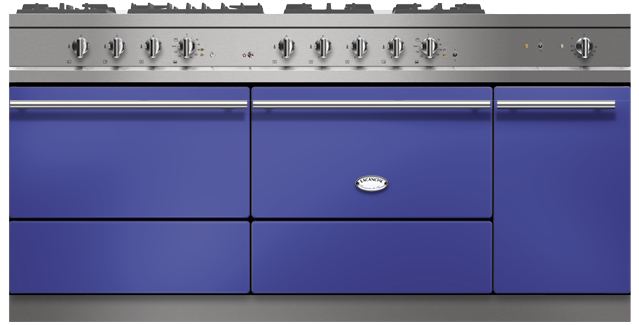 You can select any combination of gas, electric or convection ovens, warming cupboard, grill and griddle plates. Specify either a left or right warming cupboard, depending upon ergonomics and proximity to dining area. For efficiency, consider warming cupboard for side closest to your kitchen table. Click the button below to configure a Sully 1800 moderne that is perfect for your kitchen. The larger Sully-sized ovens are 21w x 12h x 18d (*16d with convection). The warming cupboard is 13w x 20h x 21d. Your choice! You may choose to make the ovens both gas, both electric, or one gas and one electric. If you choose to make one of the ovens electric, it will come standard with a toggle switch which allows conversion between static electric and convection electric. Yes! If you choose to get an electric oven, it will come standard with a toggle switch to allow conversion between static electric and convection electric. Our matte black finish is considered to be standard, and all other color finishes, including stainless steel, are considered to be premium color finish upgrades. The color upgrade charge for a Sully 1800 is $1600. Lead time for the arrival of your range is dependent on several factors: the size/model of the range you order, upgrading to a premium color finish, and then of course whether or not you choose air vs. ocean freight. As very approximate timelines, it will take about 3 months by air/ or about 5 months by boat from the time you place your order for your range to arrive at your house. *Note: Add 4 weeks if lead time includes August, as the factory is on Holiday during that time. To obtain a more accurate timeline for the specific range you’re interested in, please give us a call at: 1-800-408-2433. I adore my French blue Sully 1800. It is the centerpiece of my kitchen. It is not only aesthetically spectacular but functional, too. I cook with it everyday - from pizzas in the electric oven to braises and fish on the gas side. I've even cooked salmon in the warming drawer. My husband says I love my Lacanche more than him. It's not true. I love my Sully and husband equally. A. For the Sully 1800 model, choose an overhead canopy with the following optimum specifications: 80″ wide (86″ wide in Sully 1800 island applications) x 24″-27″deep.